The effectiveness of hand hygiene procedures in reducing the risks of infections in home and community settings, including handwashing and alcohol-based hand sanitizers. Rev Pediatr Aten Primaria. 2008;10:177-90. Non invitation of Eligible Individuals to Participate in Pediatric Studies. A Qualitative Study. Rev Pediatr Aten Primaria. 2008;10:177-90. Prise en charge de la fièvre de l’enfant: les connaissances et pratiques des parents sont-elles satisfaisantes? Prise en charge de la fièvre de l’enfant: les connaissances et pratiques des parents sont-elles satisfaisantes? Rev Pediatr Aten Primaria. 2008;10:177-90. Physical interventions to interrupt or reduce the spread of respiratory viruses: systematic review. Rev Pediatr Aten Primaria. 2008;10:177-90. The Vaccine-Preventable Disease Table Working Group. Historical comparisons of morbidity and mortality for vaccine-preventable diseases in the United States. Rev Pediatr Aten Primaria. 2008;10:177-90. Infection control in paediatrics. Rev Pediatr Aten Primaria. 2008;10:177-90. Pseudo-asthma: when cough, wheezing, and dyspnea are not asthma. Rev Pediatr Aten Primaria. 2008;10:177-90. Pain Reduction During Pediatric Immunizations: Evidence-Based Review and Recommendations. Rev Pediatr Aten Primaria. 2008;10:177-90. 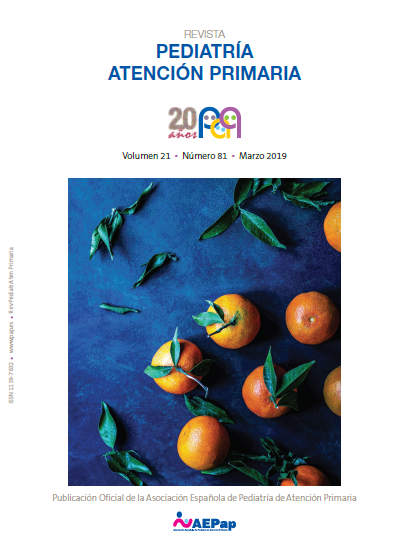 Food additives and hyperactive behaviour in 3-year-old and 8/9-year-old children in the community: a randomised, double-blinded, placebo-controlled trial. Rev Pediatr Aten Primaria. 2008;10:177-90. Books and journals review. Rev Pediatr Aten Primaria. 2007;9:711-18. Books and journals review. Rev Pediatr Aten Primaria. 2007;9:517-28. Books and journals review. Rev Pediatr Aten Primaria. 2007;9:171-81. Books and journals review. Rev Pediatr Aten Primaria. 2006;8:717-30. Books and journals review. Rev Pediatr Aten Primaria. 2006;8:547-56. Books and journals review. Rev Pediatr Aten Primaria. 2006;8:337-56. Book, Journals Review. Rev Pediatr Aten Primaria. 2006;8:181-186. Book, journals review. Rev Pediatr Aten Primaria. 2005;7:701-710. Book, Journal Reviews. Rev Pediatr Aten Primaria. 2005;7:509-518. Book, Journals Review. Rev Pediatr Aten Primaria. 2005;7:335-340. Book, Journals Review. Rev Pediatr Aten Primaria. 2005;7:147-164. Book, Journals Review. Rev Pediatr Aten Primaria. 2004;6:667-678. Book, Journals Review. Rev Pediatr Aten Primaria. 2004;6:499-510. Book, Journals Review. Rev Pediatr Aten Primaria. 2004;6:313-321. Book, Journals Review. Rev Pediatr Aten Primaria. 2004;6:135-148. Book, Journals Review. Rev Pediatr Aten Primaria. 2003;5:649-664. Book, Journals Review. Rev Pediatr Aten Primaria. 2003;5:475-485. Book, Journals Review. Rev Pediatr Aten Primaria. 2003;5:347-356. Book, Journals Review. Rev Pediatr Aten Primaria. 2003;5:167-177. Book, Journals Review. Rev Pediatr Aten Primaria. 2002;4:699-715. Book, Journals Review. Rev Pediatr Aten Primaria. 2002;4:535-545. Book, Journals Review. Rev Pediatr Aten Primaria. 2002;4:345-353. Book, Journals Reviews. Rev Pediatr Aten Primaria. 2002;4:165-176. Book, Journals Review. Rev Pediatr Aten Primaria. 2001;3:691-697. Book, Journals Review. Rev Pediatr Aten Primaria. 2001;3:507-520. Book, Journals Review. Rev Pediatr Aten Primaria. 2001;3:293-302. Book, Journals Review. Rev Pediatr Aten Primaria. 2001;3:133-145. Book, Journals Review. Rev Pediatr Aten Primaria. 2000;2:635-647. Book, Journals Review. Rev Pediatr Aten Primaria. 2000;2:473-484. Book, Journals Reviews. Rev Pediatr Aten Primaria. 2000;2:293-305. Book, Journals Review. Rev Pediatr Aten Primaria. 2000;2:147-158. Book, Journals Review. Rev Pediatr Aten Primaria. 1999;1:655-664. Book, Journals Review. Rev Pediatr Aten Primaria. 1999;1:485-497. Book, Journal Review. Rev Pediatr Aten Primaria. 1999;1:313-324. Book, Journal Review. Rev Pediatr Aten Primaria. 1999;1:127-135.